charles hugh smith-Is Our Education System Based on a Factory Metaphor? The laudable goal of the "No Child Left Behind" standards for U.S. students is to provide a uniform level of competence in core fields such as English, math and science. But perhaps this entire model of education is based on the faulty metaphor of education as a factory. I first began thinking about this some years ago when I realized that the physical plant of large high schools looked for all the world like a factory. 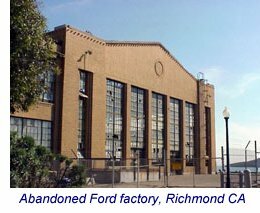 If you doubt this, please examine this facade of a shuttered Ford assembly plant in the Bay Area, and imagine it with milling students and a flagpole flying the American flag. This 1930 factory, designed by noted architect Albert Kahn, is a very handsome building. Isn't the resemblence to a large city high school rather striking? Then I began thinking of the "factory production schedule" which funneled hundreds or thousands of students into set courses within large mechanistic plants each day and each year, regardless of their individual attributes, strengths and weaknesses. Like an assembly line of manufactured articles, some students were "rejects" who couldn't make the "quality control" grade, and they were thrown on the scrap pile or dropped out when the scrap pile loomed as their certain future. The quality of the learning of 15-year-olds in the United States, particularly in mathematics and problem solving, are well below those of many European countries and also Japan, Korea, Australia and New Zealand. With its relatively high expenditure and its relatively low student achievements at the school level, the United States education system is clearly inefficient. These are matters that have not escaped notice in the United States. The Federal government’s No Child Left Behind legislative initiative is a substantial and direct attempt to address the problems at the school level. The international data in Education at a Glance 2005 are not recent enough to reveal whether this initiative is bearing fruit. Evidence on whether the No Child Left Behind initiative is working should first appear in national data. International comparisons will, in turn, provide both external evidence of any improvement and an indication of how it compares with changes in other countries. The target is not stationary since all OECD countries are seeking to elevate the performance of their education systems. The report also stated that the economic advantage of education, as measured by productivity gains, is not as clear as the wage differences between those with high school educations and those with college degrees. In other words, the overall vitality of an economy is influenced by many more factors than education. Which leads me to question: what if a kid is as dumb as a brick in math but a near-wizard in graphic arts? Do we scrap him because he didn't meet some factory-defined narrow standards for "knowledge worker"? What about all the jobs which aren't in biotech and technology? What if we required basic understanding of making meals with real food rather than the processed contents of a box? What if we required kids to know how to fill out a Schedule C form (small business) for a tax return, or change the oil in their car, or install shelving, or fill out a loan application and understand credit, adjustable rate mortgages and deductables in insurance policies? Aren't these skills more productive for the vast majority of workers than advanced math? Perhaps the factory metaphor is precisely the wrong one in a rapidly evolving global economy. Maybe instead of cramming all kids into narrow channels of "competence," we should actively filter out kids whose skills, interests and strengths lie elsewhere than math and science: the culinary arts, graphic arts, marketing, etc., all skills which cannot be shipped overseas as readily as those lauded "knowledge worker" skills of programming and gene sequencing. Perhaps we should take as a new metaphor the mixed-use, adaptable uses which will soon be occupying this old Ford factory. Some people will live next to their workshops, some will make beer, some will toil in front of computer screens; the final product mix will adapt and evolve along with its tenants. If a child finds math easy and interesting, then by all means let's encourage him or her to reach the highest levels of math and science. But if a child's strengths and talents lie elsewhere, then let's turn the factory into a workshop where he or she can thrive and acquire skills which are just as valuable to our society as a whole as advanced math and science. It's worth recalling that Steve Jobs' brief college career included an utterly impractical interest in calligraphy. That utterly impractical interest, as we know, led directly to the Macintosh computer's built-in fonts and the desktop publishing revolution which Jobs' Apple Computer single-handly launched in the late 1980s. Can you calculate the value of what would have been lost if Jobs hadn't been free to follow his interests? My own guess is hundreds of billions of dollars in software, hardware and improved productivity.